We’d love your help. Let us know what’s wrong with this preview of Play on the Field by S.M. Donaldson. No one thinks twice when Tatum Bland’s name pops up Welcome to the time where memories are made and hearts get broken. This book is part of a series, but can be read as standalone. To ask other readers questions about Play on the Field, please sign up. I received an ARC of this book in return for my honest review. I am honestly a HUGE SM Donaldson fan. There has not been a single book yet that I have not completely fallen head over heels for. This book is no exception to that rule. I am blown away. I don't know how she is able to consistently put out such amazing work and continue to keep the plots fresh and exciting. Play on the Field is the 3rd book in the series. It can be read as a stand alone. Donaldson does a wonderful job including enou I received an ARC of this book in return for my honest review. 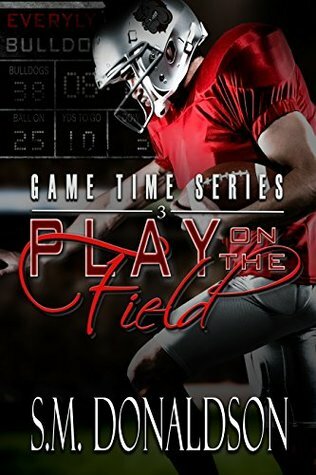 Play on the Field is the 3rd book in the series. It can be read as a stand alone. Donaldson does a wonderful job including enough information to keep you up to date with out boring you with excess information incase you have read the series. I have read the 2 previous books. I highly recommend them, and reading them in order. Although it is not required.. the characters and plots build. I love the way her series do just that. While you can read nearly all of them as stand alones, it is fun to watch the characters grow. I also love that each book is about a new set of characters. So while you get "follow ups" of the characters you already know and love you also get a great new insight to a new set of characters. This book is a Mature YA book. I do however feel that it's audience is no way limited to YA only. There are adult situations, so I would not recommend it for the younger YA crowd. I would however highly recommend this book to any older teen, young adult and adults of all ages. In this story you see a deeper insight into a previous main character's little brother's life. It can be hard being the "little brother" in a small school/ small town. He struggles finding his place in life. You also meet a new character. She is strong willed and very private. She seems to be plagued by her own personal demons. Can they both find the direction in life that makes them happy and complete? Or are they doomed to hide in the shadows of the past and/ or others? I have to say.. the female character has stole my heart! I am not normally a huge fan of the female leads. While I tend to enjoy Donaldson's women, I have truly feel in love with this one. She is strong, level headed, and can handle herself no matter what life throws at her. If for no other reason.. read this book to meet Tate. You will fall in love too! As for the plot itself, in true Donaldson fashion.. it is a roller-coaster! I mean that in the best way! You have a little bit of it all. I laughed, cried, was excited, felt love, a little lust, was angry, felt worry, and many times was on the edge of my seat. There was never a "dull" moment. Donaldson really knows how to draw you in and keep you there. Don't start this book unless you plan to dedicate the time to finish it in a single setting, b/c you won't want to put it down! I don't feel that I can say much more with out giving away spoilers so I will leave this review as it is. I do however want to conclude that I would highly recommend Play on the Field, as well as the other 2 books in the series, Crimson Catch & Guarded Heart. S.M. Donaldson is very talented and will not disappoint. Enjoy! We are pulled into the young lives again. I have loved this series. SM doesn't disappoint with giving us real teens. Brock has been with us through the last few books, but as a secondary character, Colin's little brother. He is also a football player trying to make his way up the rankings to get noticed. The hard thing about that is his brother is in the bright lights and he doesn't know if there is enough room for him too. I loved the raw and pure emotion shared by Brock. He says what he means We are pulled into the young lives again. I have loved this series. SM doesn't disappoint with giving us real teens. Brock has been with us through the last few books, but as a secondary character, Colin's little brother. He is also a football player trying to make his way up the rankings to get noticed. The hard thing about that is his brother is in the bright lights and he doesn't know if there is enough room for him too. I loved the raw and pure emotion shared by Brock. He says what he means and does what he says he is going to. Tatum moves, bullies swarmed her at her last school, her family starts new. She has a good head on her shoulders, her parents are a great support system. She knows what she needs to do to make life better. She needs to focus on school and football. I loved that she played. I loved that she has a great relationship with her parents. Her connection with Brock is electric from the start. They begin as teammates and begin spending time together. Brock is immediately protective of her and doesn't want the guys getting a peek of anything. He pushes and pushes until he becomes a part of her daily life. I loved that the story kept the fact that these are teenagers trying to figure out life. They don't know what will be of them in years to come but they know right now they like each other possibly love. I received an advanced copy to read. I'm so glad I did. This book was awesome!! The only reason it took me two nights to read was because I had to sleep, but I didn't want to put it down. If you've attended a small town high school you can easily identify with the characters!! I don't want to give out any spoilers, so I'll just say that this another must read. SM I love your books. Can't wait to read your next book!! !